Before I had Stella, I cleaned out my front beds and created a low maintenance bed that I could just add seasonal annuals to for a splash of texture and color! Every year at the beginning of September, I take out my Summer annuals and begin planting my Fall beds! 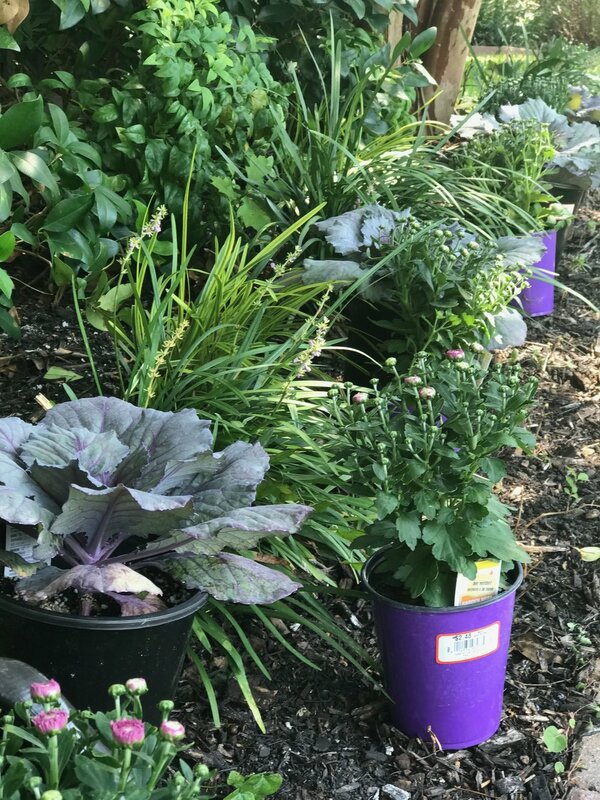 My go to plants for my Fall bed include: ornamental cabbage and kale plants, mums, and pansies! This trio has proven to be both beautiful and long-lasting for me over the years! Due to our mild Fall and Winter weather here in Dallas, my beds will remain intact until I am ready to plant my Spring beds! While my mums will die when the first frost arrives, the ornamental cabbage/kale plants and pansies flourish in the "winter" weather! I space my ornamental kale and cabbage plants about every 2-3 feet, and fill in the gaps with the quart size mums. This year I chose a soft purple color. Once pansies are available, I will line the front of my bed with a range of purple, red, and yellow pansies! If you're looking for additional plants for your flower beds or Fall pots, I also love Dusty Miller! It is a beautiful soft grey/green color and does insanely well! I find it almost impossible to kill, and it looks beautiful with the kale and pansy mix!! I hope this gives you a little Fall garden inspiration!! I'd love to see pics of your Fall beds! Share them with me on Instagram! !